The Arts are an essential part of every community which is why I make every effort to promote and defend in many cases theatre, music and visual arts around the city. 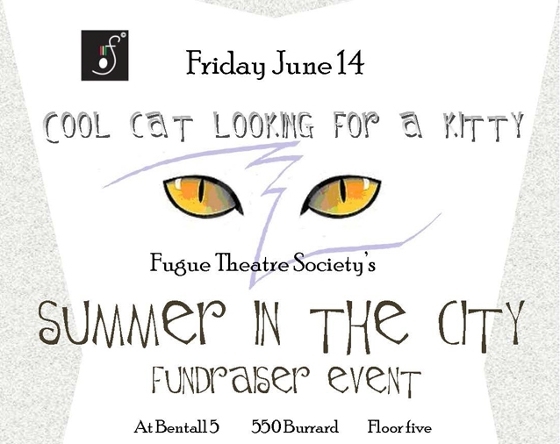 Dale and I had the opportunity to attend a fantastic event on Friday, June 14th at the Bental 5 in downtown Vancouver for the Fugue Theatre. The Fugue Theatre is a professional theatre and music organization dedicated to the commissioning and production of original operetta and music theatre. This is a non-profit organization that is working hard to fundraise for their upcoming fall production. Organizations such as these rely not only on government funding/support, but on the blood, sweat and tears of their members. It was a fantastic event that included a sneak peak of the upcoming production, an art auction, live music (I played saxophone in the band), fantastic appetizers and lively conversation. If you are interested in supporting the Fugue Theatre please visit their website and/or facebook page to learn how to donate. part of Fugue Theatre's Summer in the City fundraiser event. Promotional poster for the event.